Where are you from Originally, Portage, Wisconsin. I suppose I would call Madison, WI “home,” though I’ve been in California for a little over ten years now. A little about your self `ie your education Family life etc I grew up an only child in a small town. I spent my early years with my nose in Ray Bradbury and Stephen King—when I wasn’t out hiking along the train tracks, marching through our neighbourhood marsh, or riding my BMX from one end of town to the other. I went to college further north at the UW-Stephens Point, a small, wonderful campus with the best teachers you could imagine. I finished my English degree at Madison, so I’m both a Pointer and a Badger! 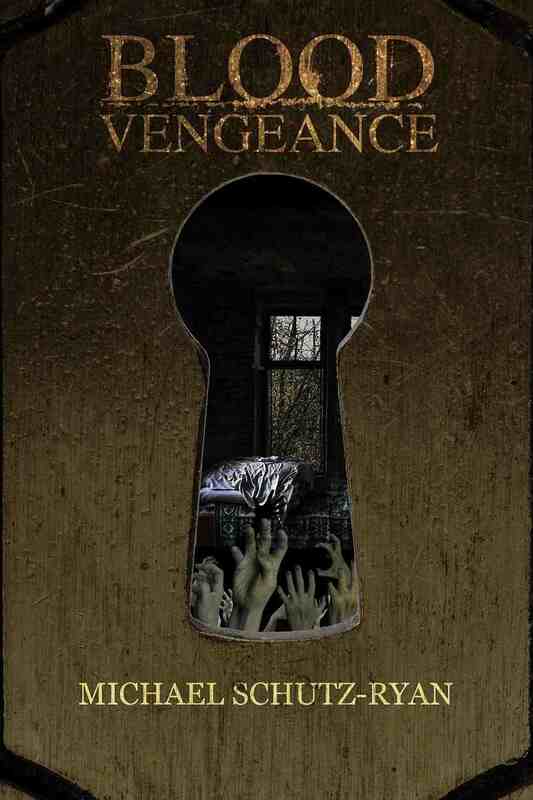 My debut novel, Blood Vengeance, was published by Permuted Press in January. I have been spreading the word about that for the past couple of months. Later this year my novella, Uninoch, will be available from Less Than Three Press. I started banging out stories on my aunt’s typewriter when I was in second grade. My parents bought me a typewriter—more or less a toy—that Christmas. I wore it out, and next year they bought me this great electric one. I’ve never looked back! I have to acknowledge my high school English teacher, Mari Newton, for this. I dedicated Blood Vengeance to her. She taught a class emphasizing imagery and metaphor, and opened up a whole world to me. She made me understand that the ideas in my head were worth writing. She read all my early short stories and encouraged me like no one else has. In 2004 I moved to San Francisco. That’s a very expensive city! When you’re broke in San Francisco, it is not the idyllic city from TV and movies. It’s a very dark place. I can’t think of a better setting for the ghost of a serial killer to continue torturing his victims! So I wanted to tell a story reflecting my own move and experience. And I wanted to show that dark side of San Francisco. It’s just as interesting—more so—than the tourist attractions. Peter Straub is a huge influence. For his Blue Rose trilogy, he talked about using a straight-forward style that wouldn’t get in the way of the action. I think my style right now leans in that direction. I think of it as lean and mean. I wanted a title both catchy and meaningful. “Blood Vengeance” sort of smacks you in the head. And in the book, there are several types of “blood” and “vengeance,” so it reflects the layers of the story. There are consequences to your actions. Everything that is said and done creates a ripple effect that, I truly believe, can survive death. There’s also an element of “be careful what you wish for.” Sort of a modern-day, horror-themed “May you live in interesting times.” Brennan Cooper wants a new life, and he certainly gets that! Of course the supernatural elements are fiction, but as far as the landscape of San Francisco, one could pretty well use Blood Vengeance as a map. Though fictionalized, and even re-named for the book, all these places exist. I think it’s a realistic look at the underbelly of the city. There is a lot of me in Brennan. A surprising number of the things that Brennan does—and endures—happened to me. In one form or another. Life in San Francisco was so bizarre at first, I only had to tweak that into the paranormal a little! Walter Farley’s The Black Stallion was the first novel I read. It lit the spark in me that I wanted to write. From there Ray Bradbury, specifically Something Wicked This Way Comes, changed my life. Stephen King solidified my early experiences, revealing a storytelling style, power, and grace that I still try to emulate. I just started Donna Tartt’s The Goldfinch. Before that, I finished Silken Prey, John Sandford. Sandford’s amazing. I love his straight-forward style, too. You can really tell that he wrote for the newspaper. It’s pitch-perfect language for his detectives. My friend and fellow author, Jason White, is an up-and-comer to watch for. And right now I’m waiting for Amazon to mail my copy of Todd Rigney’s Found—which he co-wrote into the film of the same name. My second novel, Edging, is awaiting my publisher’s final edit. That one is about a new designer drug that gives powerful, frightening hallucinations. It’s Six Flags in pill form. And as the citizens of this quiet suburb slowly get hooked, they unwittingly invite in an ancient evil that thrives on their nightmares. I thank God every day for the changes he affected in me. There are also a league of teachers that inspired me, notably Ms. Newton, Mr. Van Duren, Professors Lawlor and Warren. Definitely. Writing is all I ever wanted to do. Making a living at it is difficult, but that’s where all my energies are focused. The problem is, I’d never stop editing and rewriting! There’s always one more insight to add. One more word to be deleted. I eventually just have to stop myself! It was with Farley’s The Black Stallion. I was amazed at how words could create images in my mind. My mom had borrowed my aunt’s typewriter to write her resume, and she let me use it. I simply copied the first paragraph of The Black Stallion over and over, entranced that letters became words, words sentences, and soon it was as if a movie played in my head. I wanted to do that. That’s when I started writing my own fledgling stories. Blood Vengeance, my current release, is about Brennan Cooper, a lonely, awkward young man finding his way in the world. When he moves to San Francisco to start a new life, he stumbles upon a terrible haunting. A dead serial killer—and his victims—torment Brennan. He needs to uncover who these spirits were when they were alive and what they want now. His struggle with the forces in that apartment will change him. His fight against the evil is counterpointed by his journey into manhood. Blood Vengeance is very much about my own move to San Francisco, though my own experiences lacked the supernatural! I wanted to convey the grittiness of the non-touristy parts of the city. There really is a dark underbelly there. I get this sinking feeling whenever I realize I need to research a scene, character, or situation. My advice to writers is always to embrace research, to go out and get it done. That doesn’t mean I like to do it! I have been fortunate enough to meet great people who have talked about their work with me—from surgeons to homicide detectives and (for a current project) police dispatchers. My dad, too, is a wealth of information and usually points me in the right direction. I love Ray Bradbury’s prose. He’s the real deal when it comes to “wordsmithing.” Something Wicked This Way Comes is downright poetic. The melody of his words forms a joyous, youthful stream of consciousness. The images dance across the pages. He also writes a lot about the lure of the dark and mysterious. I still feel that sense of guilty adventure whenever I read a new book or see the latest horror movie. In a way, because Blood Vengeance never could have been written if I hadn’t moved to San Francisco! Other than that, no. An unfortunate “no.” I love to travel. When I was younger, I wanted to write a novel in each one of our fifty states. 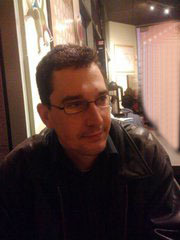 Hunter Walker designed the cover for Blood Vengeance. He did an outstanding job, too. I love how we peek into the keyhole to see the squirming mass of spirit-arms grasping the air. The sheer amount of time that it took. It was originally handwritten into five notebooks over a course of nine months. Then I delayed typing it into a word processor because the task seemed so daunting. Instead, I spent a year filling two more notebooks with notes and revisions. After finally keying it in, another year was spent ironing out edits and rewrites. I have since streamlined the process! I matured as a writer over the course of writing and editing and submitting Blood Vengeance. All the feedback I received along the way can now be incorporated into future first drafts. Don’t be intimidated about research. Investigate things. Reach out and talk to experts that do what your characters do. You’d be amazed at how much people will talk about themselves to writers! I hope you enjoy this book. There are plenty of scares and of gore. It’s a horror novel, after all. But this is a coming-of-age story, too, and I’ve tried to present a sense of loneliness, sorrow, and redemption. I like to tell stories. I hope people like the ones I tell. Walter Farley’s The Black Stallion. I worked my way through that series during the first couple of years in grade school. The Chronicles of Narnia came soon after that. Jiminy Glick makes me laugh. I don’t usually laugh out loud at comedy, but Martin Short does it for me. As for crying, I’m a total sap! Any tearjerker gets me. Stephen King and Quentin Tarantino, if I can cheat and meet two. King has been a huge influence on me, and is just a wealth of information. I loved Danse Macabre, his non-fiction book about horror films and novels. And Tarantino is the same way with film. I could talk to him for hours about movies and filmmaking. Look Behind You,” just to get in one last scare. Seriously though…I’d like to be remembered as a good son and husband. I watch a lot of movies. Horror is my favorite, but I love the Academy Awards. I watch all the nominated movies (though usually afterwards). And Hulu’s Criterion Collection is an amazing source for classic and influential films. I can’t get enough American Horror Story. But the best show on TV right now is Hannibal. I had so many doubts about it, when Anthony Hopkins embodied Dr. Lecter so completely. But Mads Mikkelsen actually does it better! And the way the writers change the storyline to keep the intrigue alive is stunning. The soundtrack’s booming and piercing percussion is thrilling. I don’t know why more people aren’t talking about this show! I’m a steak and potatoes guy. Favorite color is yellow. Musically, I’m all about classic rock. I saw Pink Floyd in 1994 and that experience changed me. Amazing! I considered a career in psychology. The human mind is fascinating. I’d still come home every night and scribble away at short stories, though. I don’t think that could be taken out of me, regardless of which alternative universe I’m in. Fiona: Do you have a blog/website? If so what is it? You can find me at http://www.michaelschutzryan.com/ and I co-host and write for Darkness Dwells www.darknessdwells.com where I share my thoughts on horror cinema.